Perhaps in some later post I will write about the monstrous jointed frame holding up the undulating single span roof and glass facades of what is currently the biggest freestanding building in the UK: designed to be ‘dismantled and reconfigured as future needs change’, according to an entry for Heathrow's Terminal 5 on the Rogers Stirk Harbour and Partners website, this definitely requires a posting all of its own. Instead I think it’s worth spending a little time looking at the deployment of flat screens within T5’s main departure hall. While the main great curve and the angles of the supporting skeleton ensure that it’s almost impossible to establish a useful baseline from which to view this vast space – even the floor itself seems less than level at times – the arrangement of advertising displays offers a series of reassuring perspectives. This dividing up of space even appears to extend into the arrangement of the roofing panels. The hidden geometry of the universe and the hidden geometry of electronics – as indentified by Mark Wigley in his historical overview of network design – are simultaneously revealed in the arrangement of these multiple flat-screen displays. The notion of the airport as commercial development – as exemplified by the likes of John Portman in their exploitation of the supersized mall as a basic model – is still there. It’s hard, for example, not to run into the red sports car last spotted inside Zurich’s Fifth Expansion. At the same time, however, there is something about the insertion of these high-speed texts and images into the environment via multiple arrangements of screens that suggests that it is less to do with conveying a message than with the setting out of coordinates. Their rapidly moving surfaces are going to catch your eye anyway, so you might as well use them to figure out your precise location. Like them, you are only passing through. Welcome to the Labyrinth. Buildings –whether examined individually or experienced as part of a city – often make for the densest of publications and consequently take a little while to catch up with – hence the retroactive posts that make up this series. Only a few years ago Berlin seemed to be rewiring itself for the future. When I was there in 2002, most of the major historical buildings were either covered by taught translucent scrims advertising telecom companies, sheeted in transparent plastic or in the process of disappearing altogether, having been bought out by design and software companies. Street maps became out of date before they were even published, and the city appeared to have no locatable centre. At night whole areas of the Mitte, where no man’s land once stood between East and West, had the desolate, depopulated feel of an industrial suburb. Pictured above: female figure at the foot of the Bismark memorial; one of the bas reliefs at the base of the Siegessäule; a cluster of modernist furniture in the rear lobby of the old Akademie der Künste; another draped figure confronts Bismark – the choice of ‘nomad’ for a tag stikes me as expressing an ironic nostalgia for the decentralized Berlin of a few years ago. 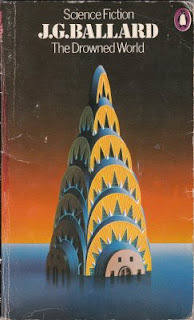 Penguin Science Fiction reprints from the 1970s with black spines and cover illustrations by David Pelham. Copy text on the back reversed out white on black. The refurbished Horse Hospital opened its doors to the public for its first Kino Kulture event on Friday with their Other, Other Cinema night. I had been asked by them to help co-curate the evening, supply some introductory remarks and serve up suitable mood music for alien abductions during the intervals. Before the event officially began I had a chance to take some pictures of the new space, which seems more dedicated than ever to screening the kind of fabulous and rare movies you’re unlikely to see anywhere else in the UK. This really is an outstanding space and I wish everyone involved in its future as pleasant an evening there as I enjoyed on April 17. As Kino Kulture now takes place where the Contemporary Wardrobe Collection was once housed in the Horse Hospital, and the Contemporary Wardrobe Collection occupies the old Chamber of Pop Culture screening and exhibition space, to attend both events within the space of 24 hours was a particularly moving experience. But as is usually the case with anything to do with the Horse Hospital and its occupants, it left me thinking more about the future than the past. Pictured above: a beautifully embroidered Horse Hospital logo on one of the front row seats; the screen, new sound system and stage area; an original Twiggy manikin looks on from the sidelines; the view from behind the screen during the Other, Other Cinema night with one of the titles from Craig Baldwin’s magnificent Mock Up On Mu plainly visible on the monitor. To celebrate the reopening of Horse Hospital after its recent extensive refurbishment I will be presenting a programme of films closely associated with San Francisco’s Other Cinema. A spiritual twin to the Horse Hospital located at the Artists’ Television Access on Valencia Street in the Mission District, the Other Cinema is home to Craig Baldwin and his amazing archive as well as providing temporary refuge for the likes of Damon Packard and Mark Boswell’s Nova Kino project. Last September I had the great pleasure of presenting a reading from Welcome to Mars at an Other Cinema event curated by Craig Baldwin and can testify to just how amazing this space can be – so be prepared for something weird and wonderful this coming Friday. 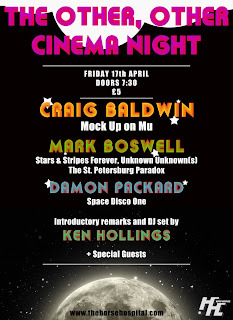 The event is scheduled to take place at 7.30 pm on the evening of April 17, when I will be showing Craig Baldwin’s latest Mock Up On Mu, Damon Packard’s Space Disco One and a selection of Mark Boswell’s short films: Stars and Stripes Forever, The St Petersburg Paradox and Unknown Unknown(s). At strategic points in the evening I will also be spinning tracks from my ever-expanding collection of space music – so together we can share a passing mood of mystery. Admission is £5.00, which is insanely cheap even in these straitened times. Earlier in the afternoon that same day – at 2.30pm and 5.00pm respectively – Resonance 104.4 FM will be repeating the two-part radio interview I conducted with filmmaker Mark Boswell during his recent visit to London at the end of February. First broadcast over the Easter weekend as part of Resonance’s excellent I’m Ready for My Close-Up strand, this freewheeling exchange covers everything from Mark’s childhood experiences as a golf caddy in Florida and how they helped shape his fascination with Soviet politics through to the lure of gun magazines, the hidden political spin to be found in The Man from U.N.C.L.E., the technology of Cold War espionage and the horrors of Disneyland. Check the Ken Hollings Google Calendar (opposite) for further details, should you still think you need them. 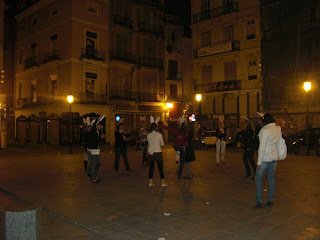 I have just received the above images taken by Ramona Ponzini last Saturday night, at the end of Spectra 09, showing what she describes in her accompanying email as ‘Lynchian bunny girls’ gathered together in a courtyard in the old part of Valencia. Ramona and I, together with Maurizio and Roberto Opalio of My Cat Is An Alien, had chanced upon the bunny girls while out taking a stroll with Rosa Arutti at around 2.00 am. 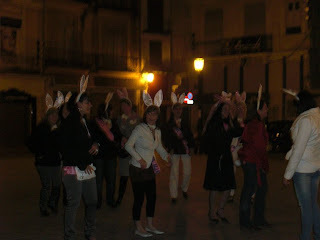 The bunnies would select a girl; the chosen one would put on a mantilla and the rest of the group would then form a circle around her and clap and sing. Once they’d finished the song, they’d select another girl to go in the centre and the whole ritual would start over again. What the white rabbit ears had to do with any of this was a complete mystery to us. Even Rosa admitted to being baffled by the whole thing. Ramona took the pictures while I recorded a fragment of the bunny girls’ song on my cell phone just to show that we weren’t seeing things that late at night. Now that I’m back in London, however, I’m not so sure. Earlier that day Rosa had taken us to a quaint little cafe to sample a local drink she said was made from almonds – you can see Maurizio, Roberto and I in the process of ingesting some of this milky fluid in the third photograph Ramona sent to me. Could it be that Rosa had introduced us unwittingly to the legendary Devil’s Milk Punch concocted by Sir Francis Dashwood of the notorious Hellfire Club and that the singing and clapping ‘Lynchian bunny girls’ were a result of its hallucinogenic properties? It seems highly likely, particularly when you consider that all the people who tried the almond drink that afternoon also saw the bunny girl ritual later that night. The mystery remains. Have a Happy Easter. Spectra 09 could not have taken place in a better venue than the Octubre Centre for Contemporary Culture, nestling as it does within the elegant shell of Valencia’s first ever department store. Five floors of art nouveau galleries rise up enigmatically from the open atrium, served by the oldest original elevator (sadly no longer functioning) in the city, while a tall panel of multicoloured lights and a seemingly endless stainless steel pole slowly move and change position under the influence of meteorological sensors and weathervanes located up on the roof of the building. Event coordinators Mike Ibañez (author of post-modern conspiracy handbook Pop Control and forthcoming novel SuperBrutal) and Rosa Arutti (AKA Spanish sound artist Nad Spiro) arranged with the director of the Octubre CCC for us all to take a midnight visit to the roof. The view of the city from up there was wonderful, although a high level of light pollution made it look as though a permanent red dawn was about to break above us. Not that anyone cared: we were all too busy taking photographs – Roberto Opalio of My Cat Is An Alien and the Cats’ ever-vigilant manager Ramona Ponzini in particular rarely put their cameras down. I know because I kept on photographing them. The following afternoon I was lucky enough to spend a couple of hours with Mike and Rosa walking around the old Barrio del Carmen sampling some of the local tapas. Together they work on radio art pieces as Pop Eye Spy – their kind and enthusiastic attention towards the participants in Spectra 09, plus their constantly diverting stream of observations, asides and ideas, helped make a completely sleepless weekend a great deal of fun. Pictured above: Mike Ibañez and Rosa Arutti consider their response to the G20 summit while ordering tapas; a vertiginous glimpse of the old elevator shaft at the Octubre CCC; Roberto Opalio focuses on the midnight skyline from the Octubre roof; Ramona Ponzini takes a flash picture while Mike and Rosa lurk in the shadows. Spectra 09 came to a fitting conclusion on Saturday night at the Octubre Centre for Contemporary Culture in Valencia with an appropriately cerebral triple bill comprising a subtitled screening of Craig Baldwin’s Mock Up on Mu, a reading from Welcome to Mars and a closing performance – ‘Cosmiconspiracy’ – by Italian masters of zero-gravity space thrash, My Cat Is An Alien. 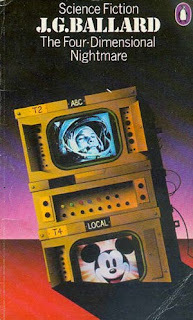 The Octubre in-house sound system was a particularly good one, meaning that Simon James’s electronic soundtrack to Welcome to Mars drew a lot of admiring comments from the audience, and My Cat Is An Alien’s audio sparks and scintillations filled the room with minimal distortion. Edited highlights from the Spectra TV webcast of the event will be posted on YouTube in due course – watch out for further posts on this in the future. 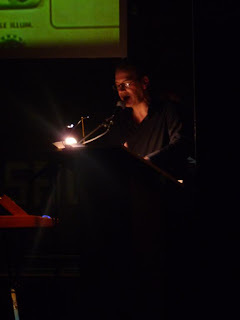 Pictured above: KH addresses the audience at the start of his presentation, with simultaneous translation into Catalan; a moment from the Welcome to Mars reading; plus My Cat Is An Alien throwing down with a light sabre at the end of their amazing ‘Cosmiconspiracy’ set. 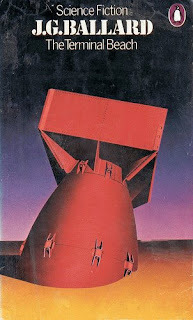 I am very pleased and proud to announce that I will be presenting a reading from Welcome to Mars as part of this year’s Spectra 09 symposium on the relationship between conspiracy and contemporary culture. The event will be taking place this weekend, and I will be appearing on the Saturday evening at the Octubre CCC, Sant Ferran, 12 - 46001 València in Spain. For more information on this event check out the truly exceptional Spectra 09 website. Also on the Saturday-night programme will be a subtitled screening of Craig Baldwin’s most recent filmic mind-bender Mock Up Mu. Note: for those unable to attend this fascinating symposium, Spectra TV will be offering live online coverage, together with 24-hour access to conspiracy films, TV shows and archive footage from Spectra 08. Those who remain uninformed have only themselves to blame. Top picture: KH presents Welcome to Mars in the underground labyrinth at the Shunt Vault last November – photograph taken by Agent King.